Singam 2 Releasing on 14- June -2013 | GSV Films :: Film news, video songs, movies news telugu, tamil hot actress. 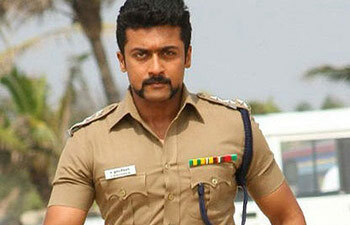 Tamil actor Suriya-starrer action-drama "Singam 2" is expected to release in the second of week of June. "The film ('Singam 2') is currently undergoing post-production work. It will have a grand audio launch on June 1 followed by worldwide release in the second week of the same month," said a statement from the production house. "Singam 2" is a sequel to highly successful 2010 Tamil action-drama "Singam", which was also remade in Hindi as "Singham" with Ajay Devgn. Hari Gopalakrishnan, who had directed the first part, wielded the megaphone for the sequel too. The film also features Anushka Shetty, Hansika Motwani, Vivek, Santhanam, Radha Ravi, Nassar, Vijay Kumar, K. Vishwanath and Manorama. Having been canned in Chennai, Hyderabad and Kerala, it has also been shot in places such as Malaysia and South Africa. The film is produced by S. Lakshman Kumar and has music by Devi Sri Prasad, who had scored for the original too. Singam 2 is ready to release in June 14, 2013. now Singam 2 official trailer release and it rocks the Tamil Nadu people.We are waiting for June 14.